At Every Home for Christ we value accountability. Each year, we undergo a rigorous audit process of our financial records according to IRS standards. The results are submitted to various organizations and associations who assure the financial integrity of our ministry. Every Home for Christ works hard to ensure that as much money as possible goes directly to the field. 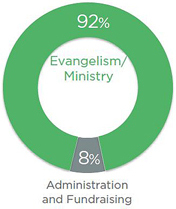 93% of all resources is used for evangelism and ministry worldwide, while 7% is used for administration and fundraising. 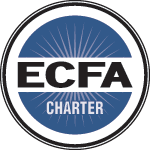 Every Home for Christ is a charter member of the Evangelical Council for Financial Accountability. Every Home for Christ is commended by Excellence In Giving for fulfilling the comprehensive Philanthropic Discovery process and is recognized for Commitment to Transparency. Every Home for Christ is a member of the National Association of Evangelicals. Contributions are solicited with the understanding that the receiving organization has complete discretion and control over the use of all donated funds.